Michael J. Davidson, O.D., P.C | George F. Brown, O.D | Ender A. Adam, O.D. | James P. Kim, O.D. Regular eye exams are an important tool in eye health for detecting and preventing eye diseases and evaluating the overall health of the patient. Some diseases, such as glaucoma, develop gradually without symptoms or vision loss, so patients may not notice that anything is wrong until significant and irreversible damage as been done. Early detection of eye diseases allows for a better choice of treatment options and a reduced risk of permanent damage. Patients should schedule a comprehensive eye exam every year. Children should also have annual eye exams to ensure proper development of their vision and prevent any interference with academic achievement. Older adults are often at a higher risk for eye conditions such as glaucoma, macular degeneration, and cataracts. Even if your eyes are healthy, a regular eye exam will allow the doctor to view the blood vessels in the back of the eye. With information obtained during an examination of the eyes, our doctors have been able to detect chronic conditions such as cholesterol, diabetes, and high blood pressure. The early detection of these conditions can lead to early treatment. 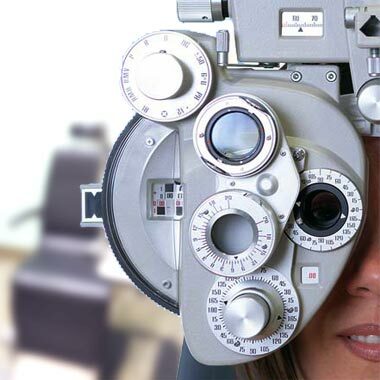 An eye exam is different than a vision screening, which only tests visual acuity, and is commonly performed by a school nurse or other health care provider. Only your eye doctor can perform a comprehensive eye exam to evaluate the overall health of your eyes and detect any changes that may indicate a vision disorder. encourage you to ask questions. We value our relationship with you and look forward to helping you maintain good vision and healthy eyes. We are available, should an emergency or urgent situation arise. Simply call our office and our doctor on call will assess your situation. If you cannot reach us, please call 911 and follow the instructions you are given or go to the nearest hospital emergency room. Michael J. Davidson, O.D., P.C. The Eye Doctors proudly serve Springfield, Burke, Newington, Chantilly, Fairfax Station, Annandale, Lorton, Alexandria, Fairfax, Fort Belvoir, Occoquan, Merrifield, Dale City, Triangle, Woodbridge, Falls Church, Dunn Loring, Clifton, Vienna, Arlington, Mount Vernon, Oakton, Manassas, Ft. Myer, McLean, West McLean, Centreville, Reston, Washington, Bryans Road, Fort Washington, Oxon Hill, Herndon, Bethesda, Greenway, Dumfries, Glen Echo, Cabin John, Marbury, and Accokeek.